Archer is the Servant of Toosaka Rin. He is sarcastic and cynical, considering Shirou's mentality of "wanting to save everyone" as naive and impossible. <hidden by spoiler settings>Archer is a Faker, an individual skilled at creating imitations of objects through the use of tracing and projection of mental images to form tangible objects. Though Projection is normally ineffective at creating durable or powerful artifacts, Archer’s unique approach to this craft enables him to materialize enormously powerful and accurate copies of the images recorded in his mind. 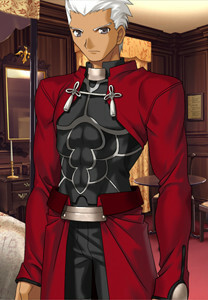 <hidden by spoiler settings>Archer is actually Emiya Shirou from one of the possible future worlds. 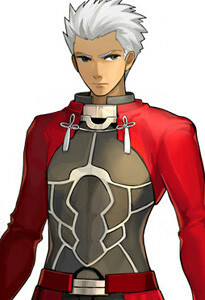 <hidden by spoiler settings>He also makes an appearance in Fate/Extra CCC as an optional boss. This is not to be confused with the playable Archer in that same game. One of the three playable servants in Fate/Extra. He is very similar to his Fate/stay night counterpart. <hidden by spoiler settings>He does not possess a Noble Phantasm, but has a reality marble called Unlimited Blade Works.